Are you ready to make a difference in your life? You can! 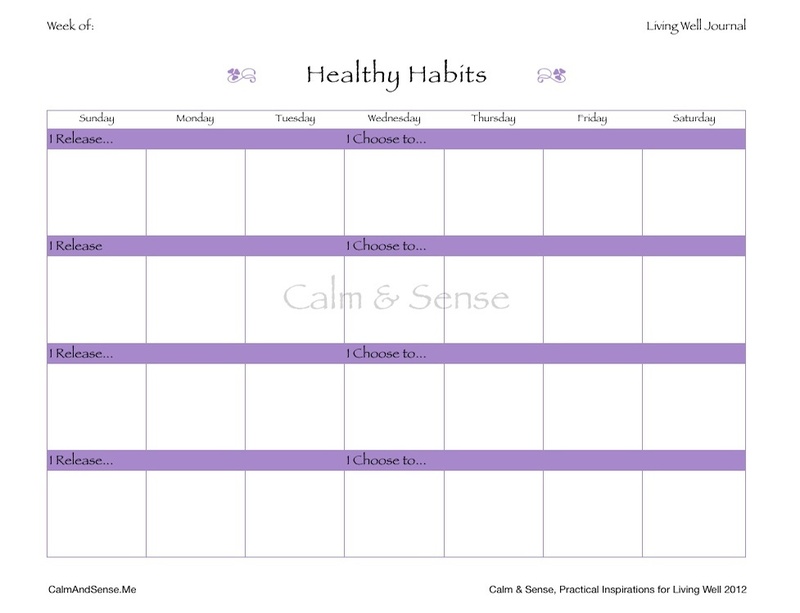 All it takes is a commitment to the process, and the Healthy Habits Journal Page is a great place to begin! A habit is simply a routine, and if you are in the habit or routine of doing something that doesn’t fully align with what you want for yourself, in health, work, relationships, etc, then creating a new supportive habit or routine will make a difference. The problem for most of us is keeping our attention on our intention! The Healthy Habits Journal Page is designed to bring your attention to the practice of habits that will strengthen and support you, and let go of habits that get in the way… including the habit of worrying, analyzing, or criticizing yourself while you’re learning a new routine! Here are 5 simple steps and a sample to get you started! 3. Write an intention statement on each purple line, one for each Healthy Habit you want to practice. For example: I Release Exhaustion, I Choose to get more rest and sleep.I Release snacking on sweets. I Choose to eat more fresh foods. See the example below. 4. Choose a time to check in with yourself every day for a week. This will be your time to review and affirm your intention statements, and make a note about how things are going. 5. Make a note in the boxes under your intention statement about your follow through each day . Keep it very simple. For example, “Watched tv 1/2 hour, not 2. Went to be on time!” Remember, the purpose of using this Journal Page is to support you in the practice of aligning your attention. This is not about evaluating, judging, or analysing anything you did or didn’t do. Continuing to bring your attention to what you want to release and what you choose to do instead, will help you to make it so! If establishing or maintaining healthy habits has been a challenge for your lately, trying using the Healthy Habits Journal Page to give yourself extra support in aligning your attention with your best intentions! For more ideas about using the Living Well Journal Pages, visit my blog Calm & Sense. **To print this form, click on it. To get a full size image (8 1/2 x 11″) set your printer to Landscape View, and adjust the size, as needed, so that it fits onto one page. My computer prints this form just right at 95%.